In nature yaks met their nutritional needs by roaming to find plants, licking on mineral deposits and other plant material and consuming fresh, clean water free choice. Ranches now confine their yaks to dry lot paddocks or pastures. Our product choices support feeding yak either free choice or scheduled feedings. Many people believe that animals know what their bodies need. In nature they would find it. Farm or ranch yaks certainly can’t roam far to meet their nutritional needs. 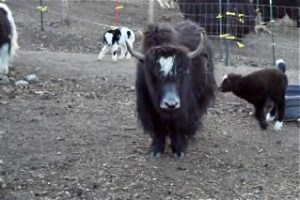 We offer products that support free choice feeding for your yak herd. SweetPro cattle/yak lick tubs are an all-natural, non-molasses, non-starch free-choice lick tub. It contains protein, vitamins, minerals, yeast, live enzymes, and pre-biotics, for improved digestion and feed efficiency. We offer tubs for your calves or adult yaks. Cattle Kandi: 450 to 650 lbs. Heavier calves, receiving cattle and for starting stockers on grass. SweetPro 16: 650 to 1,000 lbs. First calf heifers, stockers on grass, purebred operations. FiberMate 18: 900 to 1,400 lbs. Cow block for average forage conditions, cows in stalks and stubble. FiberMate 20: 1,000 to 1,450 lbs. Cow block for low consumption and tough forage conditions. Magnum: “The Stopper” Slows consumption in harsh forage conditions. Pasture Ranger: Stocker cattle and brood cows on bloat prone wheat pasture and alfalfa (High oil surfactant bloat block which helps slow digestive passage rates). PowerMate and PowerMate II: All natural supplement for first calf heifers, brood cows, stocker cows, stocker cattle, and goats. Contains Diatomaceous earth. May provide an all-natural fly control. Dry Cow: Anionic dairy dry cow and beef breeder block. Calf Tubs: SweetPro® offers two calf blocks (225lbs each) – Kaf Starter™ and Kaf Kandi™ – which are designed for essential fortification of starting calves’ requirements for vitamins A, D & E plus protein, calcium, phosphorus and trace elements including selenium. Daily intake will vary depending on forage quality and nutritional needs. Expected range of consumption is from 0.5 to 1.5 lbs per head per day and forage digestion is greatly improved. A great energy and protein source (15% for the Starter & 18% for the Kandi), weight gain is improved with a “growthy gain” that builds frame, not fat. SweetPro calf blocks help minimize bacterial scours and are convenient to feed with less waste and labor. Adult Yak Tubs: Stage of Growth Tubs: SweetPro offers a yak tubs for adult cows and bulls. The stage of growth tubs (SweetPro 16, FiberMate 18, FiberMate 20, and Magnum) are the most economical. Limiters (ammonium sulfate & biuret) are used to control in-take. We strive for 1-1.5lbs of in-take per animal per day. This level of intake is necessary to provide adequate vitamins/minerals to keep the animal healthy and also achieve improved feed efficiency. The feed efficiency the SweetPro products typically achieve is 25% depending on the amount of and quality of forage and the health/weight of your herd. If your herd is consuming more than the desired consumption rate, we recommend moving to the next more bitter tub. For example, if you are feeding the SweetPro16 and consumption is 1.75 lbs./day/head, move to the FiberMate 18. If they aren’t consuming the desired 1lb/per head/day we would suggest moving to the Kaf Kandi. We are happy to provide a free consultation to discuss the best tub for your herd. All of the SweetPro tubs are non-molasses and starch free, and contain yeast, live enzymes, pre-biotics. for better digestion and feed efficiency and all the vitamins and minerals your yak needs. Specialty Tubs: We also offer many specialty SweetPro blocks for yaks and beef cattle to include a dry cow tub, mineral ex, pasture ranger (aka bloat block), backgrounder and PowerMate tubs. All of these lick tubs come in 250lbs. We provide a natural fly benefit with the PowerMate lick tubs (diatomaceous earth) and altosid (pass thru fly chemical fly control) that can be added to any lick tub for an additional charge. If you are looking for salt, we recommend Redmond Natural’s sea salt with over 50 trace minerals. The Redmond salt blocks come in a 44lb Lick Block version. The Redmond Lick block comes in 8 different types. If you prefer to feed your yaks in a bunker setting our suggestion would be to feed SweetPro’s Fresh Start with diatomaceous earth. Fresh Start is an all-natural, non-molasses, non-starch loose supplement that is intended for hand feeding. Fresh Start contains all the protein, vitamins, minerals, yeast, live enzymes, pre-biotics and diatomaceous earth for your yak’s nutritional needs. Fresh Start can be ordered in 50lb bags or 2,000 lb totes. Please note that Fresh Start is suitable for all ages of yaks. Fresh Start is fed at 1 oz. /100lbs of body weight per day. Redmond Naturals: Redmond Naturals provide a sea salt and volcanic ash (toxin binder) conditioner, and a kelp mix in hand-fed bagged versions. The salt and conditioner are available in 50lbs bags or 2,000lb totes. Mountain Sunrise: Mountain Sunrise makes all natural (no additives/binders) hay pellets in alfalfa, various types of grass hay (Bermuda, Bermuda plus, oat, and timothy) and a combination of alfalfa/Bermuda, alfalfa/oat and alfalfa/timothy. We offer 8 kinds of hay for you to choose from in 50lb bags. We also carry the Mountain Sunrise 80/20 pellets that contain 80% alfalfa & 20% corn, also in 50lb bags. Cynthia at Mystic Ranch believes SweetPro 16 tubs provide the necessary nutrition to prepare her cows for calving and enhance milk production for the calves.